Identification of proteins from visible bands excised from Coomassie or silver-stained gels using mass-spectrometry is generally very successful. Almost all visible Coomassie bands contain enough protein for MS identification. Most silver-stain bands can be identified on our instruments. Sequence coverage achieved is dependent on the sequence of the unknown protein (does it produce observable tryptic peptides), and the amount of protein in the band. Silver stained bands must be stained with a mass-spec compatible kit, e.g. Pierce Silver Stain Kit for Mass Spectrometry, catalog # 24600. We may refuse submissions stained using MS incompatible methods. For analysis on our highest sensitivity instrument, the cost is $180 per band for Coomassie stain and $200 for Silver Stain. For analysis on one of our lower sensitivity instruments, the cost is $80 per band for Coomassie stain and $90 for Silver Stain. Bands should consist of no more than 10mm length of a single lane from a gel. We won’t accept bands that contain >10mm of a gel lane unless prior arrangements are made. We run gel band samples on our Lumos mass spectrometry platforms, or for lower sensitivity submissions we use our Orbitrap Elite mass-spectrometry platform, using a short reverse-phase LC-MS/MS method. We identify proteins from samples using Proteome Discoverer 2.2, and e-mail you an Excel summary of identifications. Stain your gel with Coomassie Blue, or a mass-spec compatible silver-stain kit. Ensure your band is no larger than 10mm of gel. The closer you can cut around a band the better. Coomassie band identification is generally highly successful. Take steps to avoid contamination of the gel band, and ensure that you provide as much information about the origin of the material as possible when submitting the sample. Rarely a protein may not produce tryptic peptides that are ionize well for mass-spectrometry. In this case it is possible that we may not achieve a confident identification. The band is weak, and there is not enough protein for a confident identification. The protein does not produce tryptic peptides that fly well in mass spectrometry, and there is not enough protein to compensate for this. 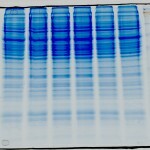 A non-mass spec compatible kit or protocol was used to stain the gel, and the proteins cannot be recovered, or are modified so that they cannot be identified by MS. Always tell us how you stained the gel when you submit samples, and provide an annotated image showing the bands you are submitting. We may reject samples that were not stained with an MS compatible kit, or where the bands excised are clearly too weak for identification. We recommend the Pierce silver stain kit as we are confident its use can deliver MS identifiable silver stain bands. We cannot follow multiple protocols for destaining / preparation of gel bands, so other staining methods may not deliver successful results. Cut silver-stain bands out of the gel as soon as possible, and destain them immediately yourself if you can. 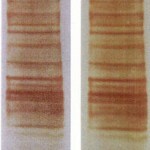 Destaining bands immediately can aid recovery of protein and improve the chance of a successful identification. If you are using silver-staining as a method to identify interesting proteins from a Co-IP experiment please speak to us about our complex mixture services. The mass-spectrometer can identify more interacting proteins from a complex mixture than can be successfully seen by eye and identified via silver-stained gel.